With a Food Science degree, you can influence food choices and possibilities! The average supermarket carries more than 20,000 items, most of which were developed into safe, affordable, and tasty products by food scientists. Imagine walking down the grocery store aisle and knowing YOU had an important role in bringing a product from farm to fork! You might work for a large multi-national corporation, with opportunity for traveling the world. You might work for a government agency or a non-profit foundation. You might start your own business or work with a small start-up company. Whichever route you choose, there's a job waiting for you. The demand for Food Science graduates exceeds the number of degrees awarded, so you can feel secure in knowing you'll be employable AND doing interesting, important work! 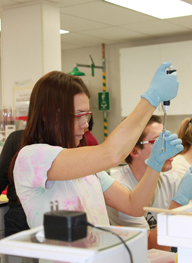 All Cal Poly Food Science graduates have a strong basic science foundation along with extensive hands-on experience in applied food science subjects. Yet the career paths are varied. Develop tastier, healthier, less expensive, and more convenient foods and ingredients. Blend the science of food with the culinary arts to satisfy consumers and your own creativity. Study the factors influencing food choices, from flavor (sweet, bitter, lemony, fresh) to texture (crunchy, smooth, slimy, tough) to appearance (dull, shiny, flat, green) to consumer mood (happy, depressed, relaxed, stressed). Investigate the source of the latest food-borne illness outbreak, create a new rapid test for pathogens, develop a better food processing method. Or work as fermentation scientist, helping optimize and control beer-making, cheese-making, and other food fermentations. Design and apply methods to analyze the chemical nature of foods. Maybe your specialty would be natural food colors or flavor chemistry. Maybe you would manage a lab testing the nutrient content of foods. Your company needs to measure sulfites in wine or antioxidants in tea - and they need you to help them do it! Facilitate the production and packaging of foods: create an environmentally friendly package, a novel way to filter juices, an energy-efficient ice cream maker. Manage the quality control laboratory, keeping products safe and consistently tasty for consumers. Keep up your company's winning reputation by supervising testing of the microbiological, physical, chemical, and sensory properties of foods and ingredients. Use your people skills to deal with both personal and technical challenges in a fast-paced environment. Imagine the satisfaction of being responsible for a tomatoes-to-tomato paste or flour-to-baked goods facility! Blend your technical knowledge, winning personality, and love of travel in a well-paying position. Guide your company through the maze of regulations, and communicate with consumers about your products in a helpful and responsible manner; or work with a regulatory agency to develop and enforce regulations that protect consumer health and pocketbooks. To learn more about Food Science careers (and for some GREAT food science experiments for junior high and high school science classes, and even for some online movies! ), link to career guidance information on the Institute of Food Technologists website.